A pristine natural environment with hills, waterfalls and forests; a wild life sanctuary and an ancient temple! Bhimashankar offers the ideal setting to find spirituality. It is also the perfect place for adventure lovers with a plethora of treks. Moreover this is where you can find the shekru the giant flying squirrel which is also the state animal of Maharashtra. Nestled in dense forests, the Shiva temple in Bhimashankar is the sixth jyotirlinga and one of the most popular places for the worship of Lord Shiva. 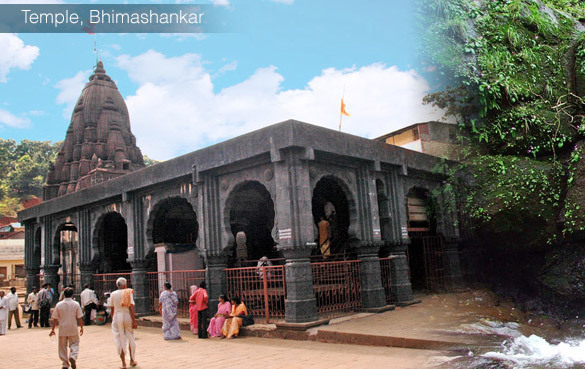 It is believed that the original temple of Bhimashankar was built in 12th century CE. However, no material remains dating to that period have been found since the temple has undergone many alterations over a period of time. The temple was renovated by Chimaji Antaji Bhide Naik in 1733 CE followed by some repair works by Dikhit Patwardhan in 1766 CE. A well was constructed in the complex by Raghunathrao Peshwa. The famous minister of the Peshwas, Nana Phadnavis carried out a lot of renovations, including the construction of the shikhara. The present temple sanctum (garbhagriha) and the shikhara are built in the Nagara or Indo-Aryan style and have a strong influence of Rajasthan and Gujarat on the figurines and motifs of the temple. The exterior walls of the sanctum are adorned with scenes from the Ramayana, Krishna Leela, Shiv Leela and Dashavataras. Inscriptions in the courtyard give a record of grants given and a large bell confiscated from the Vasai fort by the Maratha Commander Chimaji Appa hangs in front of the sabhamandapa.